Larval Images » Larval forms diverse and beautiful! 1) Teasing out details of another fish’s larval and juvenile development phases, even if in captivity, is a great addition to our body of knowledge. 2) Captive bred Candy Bass for the aquarium industry! Anytime another fish is added to the ranks of captive bred for the aquarium industry it’s a big plus for breeders, aquarium enthusiasts and conservation. This is a great effort and success from Todd Gardner at the Long Island Aquarium to get at least one (and hopefully nearly a dozen) Liopropoma sp. larvae to the settlement. Congratulations! I absolutely love the high-flying dorsal extensions on these larvae. I’m sure that it caused Todd no end of problems, but it is magnificent! Just returned from a wonderful week as teaching assistant for a coral reef ecology course that has a field component in Belize on the Meso-American reef. While I love the reefs and seagrass beds, one of my favorite spots to visit in Belize is Twin Cayes- an amazing mangrove caye. Drifting down the channel that separates the two cayes is something I look forward to every trip. Unfortunately my compatriots usually end up pulling me out of the channel as I often take a full hour to explore the same area they cover in maybe 20 minutes, but then that is the secret of enjoying the mangrove channel: minimize any movement as it stirs up silt and organics and go slow, very, very slow, edging along the prop roots at the side of the channel and allow time to take it all in. As the others go screaming along the channel, I wait well behind, letting the silt clear and the animals recover from their passage. The reward is a wealth of invertebrate and fish life, and one of my favorite marine denizens of Belize: the juvenile Sergeant Major. In Belize, we find juvenile sergeant majors in the shallows under docks and similar structures as well as in the mangroves. The adults are common in the patch reef and very common in the continuous fore-reef areas. Adults feed on coraline algae, copepods and other small crustaceans, anemones, tunicates, and invertebrate larvae. Juveniles appear to feed on benthic and planktonic algae, invertebrate larvae and small crustaceans (copepods especially?). Matt Wittenrich at Florida Institute of Technology has successfully (though with great difficulty) raised larvae from egg hatch through metamorphosis by feeding them green water and wild caught plankton using a flow through system to clear out whatever the juveniles did not eat. He noted through observations they would eat rotifers and green water (algae) but really grew best when they had plenty of copepods to eat. 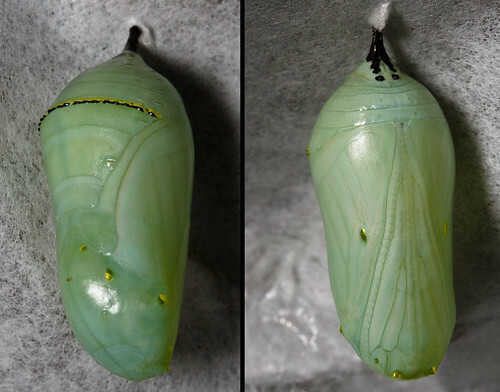 Below are his images of the larval development from ~1 day post hatch to ~20 days post hatch when metamorphosis is complete. 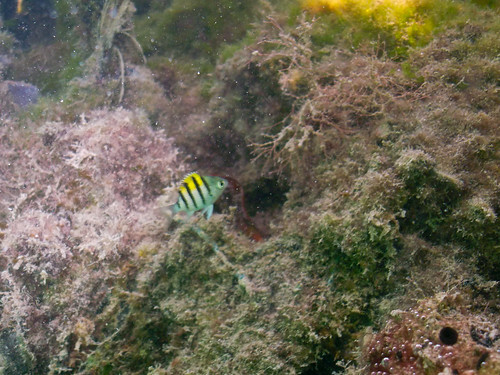 Juvenile sergeant majors are one of the fish I see most commonly under the prop roots of Twin Cayes. 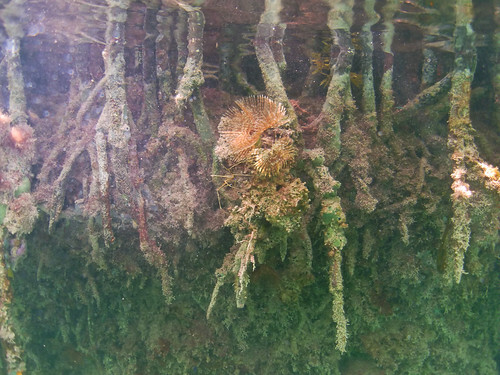 They alternate between flitting nervously around a prop root or patch of algae as I come past and charging out to challenge me, then retreating back to the safety of prop root or algae “nest”, which is a behavior they continue to show out on the patch reef when they are 15cm in size. 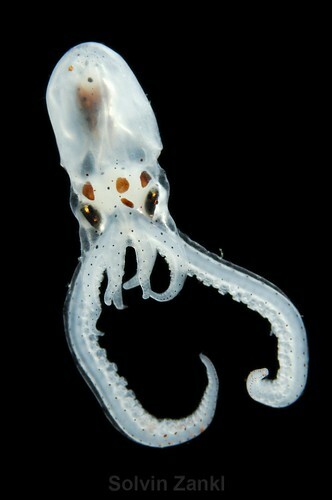 There is something very special about cephalopod young for me. Technically cephalopod young are called “paralarva” and not “larva” as there is no metamorphosis in the young stages as there is with true larval life cycle organisms such as sea urchins, mollusks, butterflies, etc. Cephalopod embryos follow direct development and hatch essentially as miniature adults, ready to scavenge or hunt for food. However many species of cephalopod young do have significant differences in the proportions of their body parts and may lack some of the specialized structures of the adult forms. Many species also differ ecologically from the adult forms. Because of these morphological and ecological differences the young of cephalopods are usually termed “paralarva”. This little one is the paralarva of Octopus defilippi or Atlantic longarm octopus, (sometimes also listed as Lilliput longarm octopus) originally described in 1851 by the great cephalopod (well all molluscs actually) naturalist Jean Baptiste Vérany. One of my favorite things about the species (adults at least) is their mimicry behavior such as this video (also below) from the Hanlon lab at MBL taken by one of our former lab mates, Anya Watson. In the video O. defilippi takes the color and shape of a peacock flounder as disguise to travel across open bottom. Jax Shells also has some great photos of O. defilippi in a couple different color and texture patterns. Reminder to self (and anyone else) before upgrading your installation of wordpress to the latest it is a good idea to upgrade and turn off all plugins (or as many as possible) and re-enable them after the upgrade. Fortunately I had a mirror of the old site right before the update so I was able to restore that and examine the plugins. Only three were common to both blogs, so I turned them off, then recopied the new modified files back. Sure enough everything worked fine. While fish don’t go through complete metamorphosis, many species do go through radical changes from birth through “settlement”. In Belize many of the larval, and post larval juvenile, forms of reef fish can be found in the mangroves including the boxfishes (Ostraciidae), a family of teleost fish which includes fish often named cowfishes and trunkfishes. On my trip to Belize I was thrilled to find some juvenile spotted trunkfish, like the one above, among the mangroves myself. The above picture however is from the Smithsonian Institution’s Larval Fish Group. The Larval Fish Group is one of several excellent resources for larval fish. Eventually this small (~1.0cm) larvae will grow to become an up to 40cm long (~16″) adult feeding on algae and small benthic (bottom) invertebrates such as mollusks, crustaceans, tunicates, sessile tunicates, and echinoderms (sea stars, sea cucumbers and urchins). 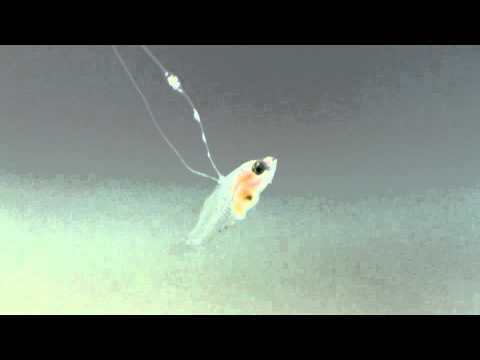 They spawn at dusk releasing large eggs (~2mm) into the pelagic ocean. After hatching the larvae will remain in the nekton. The plates that form their armor begin to develop as lumps in the early preflexion larval stages. In Gulf of Mexico sampling they were rarely found and at the pre-settlement stages there were no uniquely distinguishing characteristics to allow identification of pelagic larvae to the genus or species levels. According to William’s wonderful Early Stages of Atlantic Fishes (Marine Biology), Ostraciidae spend a short amount of time as pelagic ichthyoplankton, settling rapidly to seagrass beds and mangroves. Eventually they do recruit back to the reefs to settle and develop a fiercely guarded territory on the reef. They hunt by blowing jets of water into the sediments around the reef to uncover and dislodge the small inverts. Some boxfishes (Ostraciidae), including the Spotted Trunkfish (L. bicaudalis) have another form of defense beside their armor. They release a compound called ostracitoxin when stressed which can kill other fish, making members of the boxfish a poor choice for aquaria. Böhlke, J.E. and C.C.G. Chaplin, (1993) Fishes of the Bahamas and adjacent tropical waters. 2nd edition. University of Texas Press, Austin. Richards, W.J.(ed.). (2006) Early Stages of Atlantic Fishes: An Identification Guide for the Western Central North Atlantic. Taylor and Francis, Boca Raton, FL pp. 2640. Yummm… necrophagous larvae, or maggots, of the Blue Blow-Fly,Cynomyopsis cadaverina (Robineau-Desvoidy). The larvae of many species of fly feed on dead tissue. This is highly useful as an ecosystem service as they very effectively clean up any carrion that is missed or left over from any larger scavengers. Some species maggots feed only on necrotic tissue leaving surrounding healthy tissue completely alone. These maggots clean out the dead tissue of large wounds in the wild and have been reintroduced to modern western medicine recently in a procedure called maggot debridement therapy. The therapy wass reintroduced by a Dr. R. Sherman from the Long Beach Veterans Hospital. He set up breeding of the Green Bottle Fly (Phaenicia sericata). These “Medical Maggots” are disinfected and introduced into wounds with non-healing necrotic tissues. The larvae dissolve and eat only the necrotic tissue, at the same time cleaning the wound of bacterial infection and the combined action of the necrotic tissue removal and secretions released in feeding significantly stimulate new healing of the wound. C. cadaverina is also an important maggot, but it is used more in forensics. Different flies lay their eggs (oviposit) on carrion at different times and have different larval growth rates. By examining the maggots and eggs on a body and measuring the length and developmental stages of the maggots, forensic entomologists can determine roughly when death occurred. C. cadaverina oviposit 1.5 days after death according to Byrd & Castner’s Forensic Entomology. Of course th question can arise, how we know that a maggot arose from an egg laid on the body in question and whether it has actually fed upon the body. One way to find out ould be to examine the contents of the maggots gut. Of course the contents of the maggot’s gut aren’t like looking at the contents of a fish gut. Investigators discover maggots but no body of any type, suspect possible foul play. Maggots are discovered, but not directly on a corpse, and alternative food sources are near. Maggots are found on a corpse, but may have come from somewhere else. In the first case, if there are necrophagous maggots present there must have been a carcass nearby recently. If it was human then there may need to be an investigation. In the second case, because larva can crawl they may leave a corpse if disturbed or if the soft tissue is gone before they have grown enough to enter the pupal stage. If there are other food sources nearby the issue is to determine which food source the maggots originated on. Similarly in the third case it may be that the maggots found on a corpse may not have originated on that corpse as the maggots can crawl several meters and with the presence of other food sources may have crawled from a different source. If so those particular maggots should not be used to calculate the time of death. Wells et al. raised eggs to the third instar maggots on human liver from a liver transplant patient. Since the eggs were collected from the wild, they allowed some maggots to pupate and were positively identified as C. cadaverina. They dissected the crops out of the maggots and adult flies and then extracted the DNA from the crops and their contents. The team performed two PCR reactions for each DNA extract. One PCR reaction used primers for fly cytochrome oxidase subunit one (COI), the other used primers for a region of human mtDNA. All the maggot and fly samples successfully amplified the fly COI fragment, and the human blood did not. The adult fly’s crops did not show human mtDNA as expected. They were able to successfully extract human mtDNA from the maggot crops that had fed on the donated liver as well as the blood sample donated by the liver transplant patient. The sequence from the maggot crops differed slightly (two position) from the blood sample. So they were able to conclusively identify maggots which had fed on human tissue, advancing the ability to use maggots in forensic investigations. Chrysalis Day 9, originally uploaded by eclectic echoes..
25 days after hatching from an egg, 9 days after becoming a chrysalis, this was at 6am, by 8pm the female monarch was out and ready to go free. Free, originally uploaded by eclectic echoes. The caterpillar ceased eating on the morning of day 15 post hatch. It migrated to the highest position afforded to it, then spend all day looking for an attachment point and maneuvering into position. 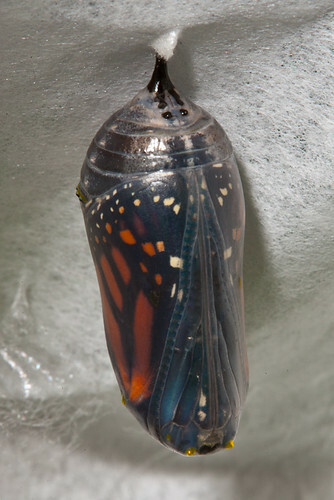 Early on day 16 it entered the “J position” and molted the outer skin one last time forming the chrysalis. The caterpillar progressed from a 53.9mm 5th instar to a 25.4mm long chrysalis. 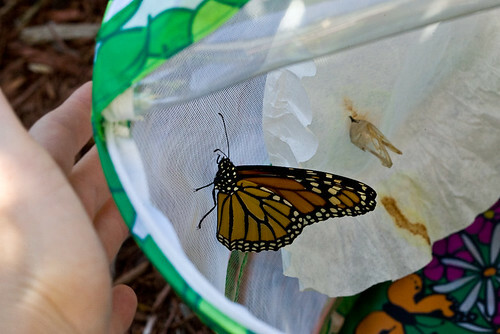 Depending on temperature the butterfly will complete metamorphosis and eclosion in about 11 to 15 days. Looking at the closeups you can see a line dissecting the 8th abdominal sternite which is only seen on females. In the image below the line is circled. I wanted to document for myself and other some of the tools I use in creating this site. I need to do this for Eclectic Echoes as well, but that site has been around for quite some time, and I just don’t have the time for such a task over there now. Maybe someday. Here though, I am starting clean, so I will try and get ahead and stay on top of the colophon as I develop the site. You will find the Colophon link at the top of the page above the zoea image and the site header. I also need to give credit to the photographers whose images I use in the rotating header for this site. The colophon is the perfect place to do this. Right now there are 7 images in the rotation. Two are mine, the rest come from other photographers on Flickr. I have set up a poll in a separate posting where you can vote on your 3 favorite banner images as well.